Mourners hold a portrait of Cambodian government critic Kem Ley during a funeral ceremony in Phnom Penh, Cambodia, Wednesday, July 13, 2016. “Increasing numbers of people showing up to support Kem Ley, even after his death, for several days, is a signal to the government of this ‘thinking revolution,’” said Meas Nee. The murder of popular political analyst Kem Ley earlier this month, and the fallout from the killing, could push more Cambodians to question the actions of authorities and even to stand up against the ruling party, local observers say. Kem Lay was gunned down on July 10 while enjoying his regular morning coffee at a busy Phnom Penh intersection. A suspect has been apprehended for the murder, but many believe the analyst, an independent-minded critic of powerful people in Cambodia, was the victim of a political assassination. Hundreds of thousands of people took to the streets Sunday for a funeral procession, in which Kem Ley’s body was paraded from a pagoda on the Chroy Changva peninsula to his birthplace in Takeo province. His killing came amid increasing use of the court system to arrest opposition lawmakers and other critics of the ruling Cambodian People’s Party (CPP) and its leader, Prime Minister Hun Sen. The political opposition’s main leaders are out of action—one, Sam Rainsy, is in self-imposed exile and the other, Kem Sohka, is confined to the headquarters of the Cambodia National Rescue Party, avoiding charges relating to an alleged extramarital affair. Still, the ruling party warns of the danger of a “color revolution” in Cambodia, drawing dark comparisons with the Arab Spring uprisings that have led to civil wars in Syria and Libya. Meas Nee, a social development analyst who worked alongside Kem Ley, told VOA Khmer that Cambodia’s ruling elite should in fact be more concerned about a revolution taking place in the minds of Cambodians. ​Immediately after the shooting, hundreds of people gathered outside the gas station convenience store where Kem Ley’s body lay motionless in a pool of blood. They blocked police from taking the body away, and instead held a procession of Kem Ley’s corpse to the Wat Chas pagoda, several kilometers from the scene. There the body had remained in repose until Sunday, visited in the meantime by thousands of people, many traveling from the furthest corners of Cambodia. Domestic politicians and foreign diplomats also attended, including Tom Malinowski, the U.S. assistant secretary of state for democracy, human rights and labor. 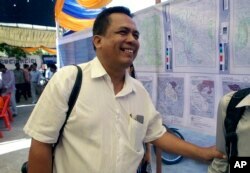 During his life, Kem Ley repeatedly vowed he would continue his work of researching and writing on social issues, despite the sensitivity of many of the subjects he tackled. He often predicted he would one day be shot dead because of this work. He was working on a collection of 99 fables—he had so far written 19 and posted them on Facebook—using animals as characters and other devices to criticize individuals indirectly, both people within the government and the opposition, and those in powerful families, including Hun Sen’s. In this June 4, 2016, photo, prominent political analyst Kem Ley smiles as he celebrated the 67th anniversary to commemorate the Kampuchea Krom territory's return to Vietnam by the French government, at Chroy Changvar, in Phnom Penh, Cambodia. Kem Ley was also carrying out what he called a “100-night campaign,” traveling around the country and talking to people about the problems they face. This included visits to islands near the borders with neighboring countries, an interest that touched on the highly sensitive issue of Cambodia’s border with Vietnam, over which two opposition politicians have been detained in the recent past. Just days before his murder, Kem Ley publicly discussed—including in an interview with VOA Khmer—a report by Global Witness detailing the relationship between the longevity of Hun Sen’s power and his family’s business empire. CPP spokesman Sok Eysan told the “Hello VOA” radio program on Monday that the ruling party and government had been the losers from Kem Ley’s murder, since many people were quick to blame them for the death of a popular figure. Much of Kem Ley’s work was focused on mobilizing the population to stand up against abuses of power. But the possibility of so-called people power taking root unsettles the country’s rulers. 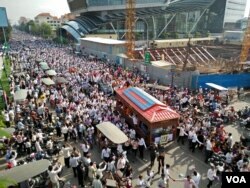 Officials have warned that any talk of “color revolution” will lead to consequences. In March, university student Kong Raiya was sentenced to 18 months in prison for allegedly calling for such an uprising in a Facebook post. Amid the shock of Kem Ley’s death, the country has grown more tense. Reports spread last week that the Cambodian military was moving tanks from their positions along the Thai border toward Phnom Penh. An overseas activist and former solider called in video shared online for a military coup against Hun Sen, to little effect. Meas Nee insisted that for the government to fear something like a “color revolution” was missing the point. “Cambodian society today has reached a crossroads where we see people are having a ‘thinking revolution,’” he said. This only makes things worse, Meas Nee said. Pa Nguon Teang, the executive director of Cambodian Center for Independent Media and a member of a committee in charge of the funeral, said Kem Ley’s bravery had already had an impact on the Cambodian people. “His model already got deep inside the people’s hearts, especially in young people. So I believe they will stand up and continue Kem Ley’s mission,” he told VOA Khmer.